After an extended crypto winter that saw different projects wrecked and developers calling it quit, it appears that the path towards stability is cooperation. Tron has been pretty successful in that and now Wanchain, an Ethereum fork which is creating solutions for cross chain interoperability allowing seamless value transfer between heterogeneous blockchains, will this year support EOS—the fourth most capitalized coin and a project ranked as “Superb” by CMC’s new partner, a blockchain analytic firm, Flipside. Also Read:Could Bitcoin (BTC) Follow Gold’s Long-Term Chart? All in all, 2019 could be an interesting year for DEXs thanks to continued pummeling of centralized exchanges and increased oversight (and demands) from protective regulators. Aside from Wanchain—Loopring initiative, Binance is testing their version. However, should liquidity be overcame then we may as well see a migration towards secure DEXs thereby drawing additional demand to EOS—ranked as the best platform by China’s CCID. From a top-down approach, sellers are technically in charge and EOS is trending within a bear breakout pattern thanks to mid-Nov 2018 sell-off. Nonetheless, in the short-term and in a classic bear breakout pattern, the current pullback could as well be the second stage—the retest phase (targets at $4—which has been retested) before a trend resumption phase begins. 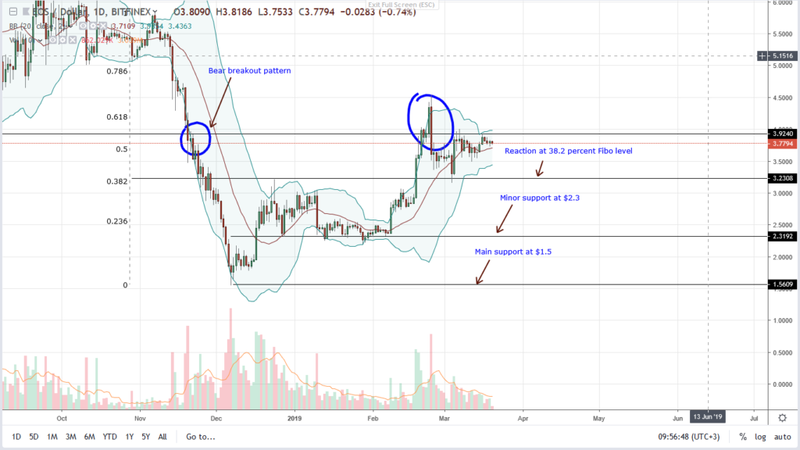 Therefore, while we are bullish and anchoring our analysis on the bullish breakout bar of Feb 18, we should also realize that the failure of bulls to muster enough momentum and satisfactorily close above $4, reversing losses of Feb 24 is bearish for EOS. If EOS fail to close above $4.5 complete with above average volumes exceeding 18 million in days ahead and instead drop below $3, we shall have solid reasons to exit this trade as bears of Feb 24 flow back. If not and prices rally, then bulls of Feb 18 would be present and in that case, first targets will be at $6. 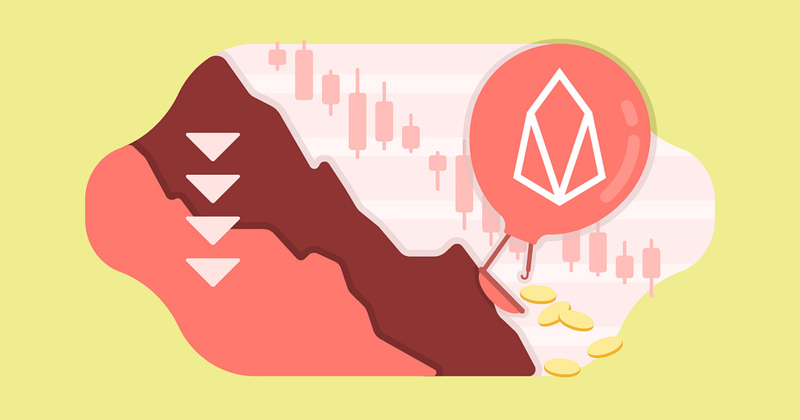 Our EOS/USD price analysis is based on Feb 18, 24 and yesterday’s average at 14 million, 18 million and 3 million according to streams from BitFinex. Since we are bullish, we expect prices to edge higher and, in that case, EOS must print above $4.5. As a result of this position, accompanying volumes must exceed 18 million as price action confirms bulls of Feb 18. Conversely, losses below $3 must be complete with equally high volumes exceeding 18 million and recent averages confirming liquidation of Feb 24.